Gov. Dannel P. Malloy rolling out his bump-stock bill in January with with Po Murray, left, of the Newtown Action Alliance and Dora Schriro, the commissioner of emergency services and public protection. Gov. 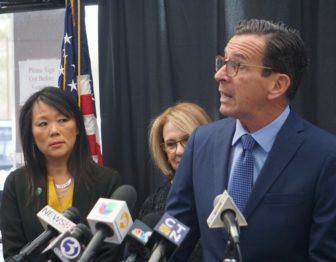 Dannel P. Malloy on Monday reiterated his disappointment over a legislative committee’s failure to vote Friday on his bill to prohibit the sale of bump stocks in Connecticut, but another legislative committee is set to take up similar legislation later this week. Malloy’s proposed bill would ban bump stocks, binary trigger systems and trigger cranks, devices that allow a semiautomatic weapon to fire at a rate similar to a machine gun. Several states around the nation have enacted or are considering their own bans on bump stocks, which a shooter in Las Vegas used to kill nearly 60 people and injure hundreds more attending an outdoor concert in October. Malloy criticized the Public Safety and Security Committee for failing to act late Friday. The committee’s Democratic Senate co-chair, Tim Larson of East Hartford, said Monday the committee didn’t act for “technical” reasons. “I think it was just the mere fact that we had a rather full agenda with a myriad of gaming bills, and the fact that this was a straight referral to another committee that already had this on their agenda,” Larson said. Larson said he thinks there is a lot of support on the committee for banning the devices. The committee’s Republican Senate co-chair, Tony Guglielmo of Stafford, did not return a call seeking comment. Malloy said his staff had been told the public safety committee would be voting on the legislation but then did not. “If it happens in one committee, it can happen in two committees,” the governor said. The Judiciary Committee has scheduled a public hearing for Friday on a similar bill banning bump stocks. It also has raised another bill that would prohibit “ghost guns,” which are kits sold over the internet that allow buyers to make untraceable, homemade firearms from parts. Rep. William Tong, D-Stamford, House co-chair of the Judiciary Committee, said the scourge of gun violence is not just limited to the gun show loophole, gun traffickers or ready access to firearms across the country. “It’s really about technology now and both the ghost gun and bump stock bans are about technology,” he said. U.S. Sen. Dianne Feinstein, D-Calif., introduced a bill that would ban the sale of bump stocks in every state shortly after the Las Vegas shooting last fall. But that bill, and all other federal gun control legislation, are stalled in the GOP-led Congress. Since Congress has failed to act, a number of cities and states have moved on their own to ban bump stocks, and others, including Illinois, Maryland and Delaware, are, like Connecticut, considering similar action. California, Florida, Massachusetts, New Jersey and the cities of Denver and Columbia, S.C., already have imposed bump stock bans. The NRA and the Trump administration want to outlaw bump stocks through executive action, not legislation. But the Bureau of Alcohol, Tobacco, Firearms and Explosives has concluded it does not have authority to ban bump stocks because they are an accessory, not a firearm. That means that if the Trump administration bans bump stocks through new regulations, as it is in the process of doing, that ban is likely to be challenged in federal court. Critics of a bump stock ban insist you can achieve basically the same firing speed with rapid trigger pulls, or even rubber bands. They point out that a Florida gunman fired 150 rounds a minute in a Parkland, Fla., high school without the help of a bump stock. “Frankly listening to these kids from Florida and their effort, we’ve got to do everything that we can to continue to send the message that we don’t need this type of firepower on our streets,” Larson said. Washington Correspondent Ana Radelat contributed to this story.